Forty-nine patients participated in a study comparing cognitive-behavioral group treatment (CBGT) for social phobia with a credible placebo control. 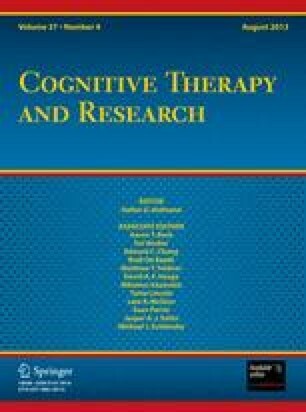 CBGT consisted of exposure to simulated phobic events, cognitive restructuring of maladaptive thoughts, and homework for self-directed exposure and cognitive restructuring between sessions. Control patients received a treatment package consisting of lecture-discussion and group support that was comparable to CBGT on measures of treatment credibility and outcome expectations. At pretest, posttest, and 3- and 6-month follow-ups, patients completed assessments that included clinician ratings, self-report measures, and behavioral, physiological, and cognitive-subjective measures derived from a behavioral simulation of a personally relevant phobic event. Both groups improved on most measures, but, at both posttest and follow-up, CBGT patients were rated as more improved than controls and reported less anxiety before and during the behavioral test. At follow-up, CBGT patients also reported significantly fewer negative and more positive self-statements than controls on a thought-listing task following the behavioral test. Regardless of treatment condition, follow-up changes in clinician-rated phobic severity were significantly related to changes on the thought-listing measure. This study was supported by grant no. 38368 to Richard G. Heimberg from the National Institute of Mental Health. Portions of this paper have been presented at the annual meetings of the Association for the Advanced of Behavior Therapy, 1985, 1986, and 1987. We wish to express our appreciation to David H. Barlow, Ph.D., our colleague and the director of the Phobia and Anxiety Disorders Clinic, whose support of this study made its completion possible. We also wish to thank Drs. Monroe A. Bruch and Ronald M. Rapee for their comments on an earlier draft of this manuscript, and Karen Law, Shari Landes, Elizabeth Ann Mundt, David Gansler, David Drobes, and countless others who contributed their time and energy to the project.